Looks more like Smokin’ (Hello) Kitty. I noticed that you have changed the text related to spam bot chanllenge. Also, added the option of email notification, which cannot be appreciated enough. (BTW….) The Japan Times just had an interesting article about phrases used to describe mixed-race children. I liked to use “double” prior to reading the article yesterday, but now I have to rethink that. When I look at your photos they are kind of like morphine for my Japan addiction. Its winter here so seeing your pictures of that Onsen town make me nostalgic for our trips to Yumura. In many of your photos I noticed you keep the f-stops low: like f2.8. In many of your photos the low f stops make for great aesthetics. The shallow focus even gives some of your more mundane* photos an introspective almost personal diary quality that makes them fascinating. 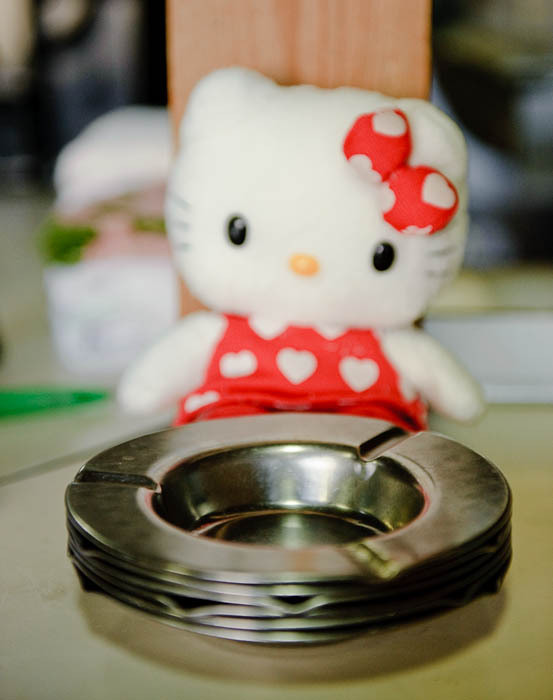 This recent Hello Kitty photo did make me want to ask about your personal preferences. In that photo the ashtrays are in focus and Kitty-chan is out of focus. In the photo right below of the sakura blossoms in front of the stone lanterns –I think that photo was set up better. You focus on the flowers but you find your self wondering about the rest of the shrine (which is just out of focus). Then again, maybe that reverse focus along with your caption is what makes it interesting. Either way…. I’m curious to know what are your personal preferences in regard to depth of field? Do you ever go high in your f-stops? Do you ever hyperfocus? Thank you for your blog. Thank you for your EXIF info too, that is equally fascinating. Seriously. Thanks for the kind words. I definitely do like to shy toward a more shallow depth of field, because I like to control (excuse the pun) the focus of the image, and often the background is just a distraction that I want to blur. I shoot in aperture priority mode almost exclusively, picking my aperture and only revisiting the exposure if I see that the shutter or ISO have been moved by the camera into dangerous territory. I also take a lot of bracketing-like shots where I quickly take three or four shots at various aperture, just so that I can study the results later and pick the one I like the most. In the case of Kitty-chan, I have a shot of her in perfect focus, but the result is somehow vastly less compelling. I can’t explain why. Maybe because while both communicate the scene, I found the sharp-focus Kitty to be simply a snapshot that did nothing more than communicate the scene, but the one I posed was somehow less-flat, more artistic, more interesting. I dunno.